An international team of researchers at Institute for Molecular Science in Japan and Max Planck Institute of Biophysics in Germany reveals an ion transport mechanism of sodium/proton antiporter by simulating its motion. Based on the simulations, they now design a faster transporter by making mutation on "gate" of the transporter. Germany is the bloc’s biggest greenhouse gas emitter. Withered corn and wheat fields forced Germany to import grains for the first time in 24 years. “Germany has gone from being a climate pioneer to a laggard,” Kemfert said. 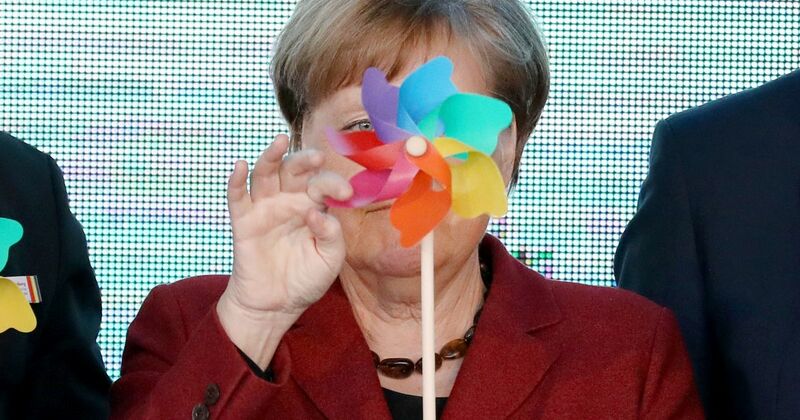 German Chancellor Angela Merkel will be joined by French and Norwegian ministers Tuesday to officially open a massive wind farm in the Baltic Sea, a key project for her country's "energy transition". Here are three things to know about the Arkona wind park ahead of the political festivities. Erected in just three months last year, they are already supplying 385 megawatts of electricity -- enough for around 400,000 family homes. Two large 'real-world' studies conducted in Germany and the USA have confirmed the high rates of sustained virological response (SVR) observed in controlled clinical studies of glecaprevir/pibrentasvir (G/P) involving individuals with hepatitis C virus (HCV) infection. Income and social status have an increasing effect on life expectancy in Germany. On average, men with very low retirement pay die five years earlier than those who are much better off. Poverty shortens life. In a new report, researchers at the Center for Disease Dynamics, Economics & Policy (CDDEP) conducted stakeholder interviews and literature reviews in Uganda, India, and Germany to identify key, global access barriers to antibiotics. With the clock ticking down to Brexit, a tiny German village is preparing to take center stage as it becomes the new geographical center of the European Union when Britain leaves the bloc. It takes about an hour to drive the 55 kilometers from the current midpoint, in the municipality of Westerngrund, in southern Germany, to Gadheim. A sign proudly reading the "future center of the EU" already greets visitors outside the hamlet. BERLIN (AP) — Young German activists who have staged weekly "school strikes" to bring attention to climate change issued demands Monday that would require Germany's government to adopt measures far more ambitious than current plans for to curbing greenhouse gas emissions. “The fourth quarter of 2018 might be a harbinger of things to come,” the chief executive officer of JPMorgan Chase & Co. said Thursday in his 51-page annual letter to shareholders. Dimon cited a raft of issues driving the more pessimistic outlook, including uncertainty about the Federal Reserve’s interest-rate shifts, Germany’s economic slowdown, Brexit and the U.S.-China trade spat. Hitler's Super Submarines: Could They Have Helped Nazi Germany Win World War II? Germany recorded its warmest year in 2018, a period also marked by a drought lasting months, the country's DWD weather service said Tuesday. The average temperatures for the year reached 10.5 degree Celsius (50.9 degrees Fahrenheit), a new record high, the DWD said in a statement. "It was the warmest year in the 138-year temperature records of the national weather service," the service said.